What is Subnetting ?-Subnetting is the process of diving a network into small networks and is a common task on IPV4 networks. As an analogy imagine a school and we need to split it into class rooms. But why split it into class rooms? The answer is to stop classes interfering with one another. Now each classroom has a desk with a computer and we have been tasked with creating a labeling system for the computers. Now say we have 30 classrooms each with a maximum of 30 students and computers. We need two digits for the classroom which would allow for a maximum of 100 classrooms (0-99). We need two digits for the computer which would allow for a maximum of 100 computers (0-99). If we also say that classroom numbers 0 and 99 and computer numbers 0 and 99 were reserved and not allowed to be assigned then we now have a maximum of 98 classrooms and 98 computers which is enough for own requirements. There are many possible permutations we just need to pick one and tell every one about out labeling scheme. Lets assume we go for 2411 where 24 is the classroom and 11 is the computer. So now when we see the following 0223 we now know that this refers to classroom 2 and computer 23. This we do easily in our heads once we know the labelling scheme. We could even make it easier for ourselves by creating a paper mask that we put over the label that would reveal the classroom. Just like in our classroom example an IP address is split into two components a network component and a node component. So the address 10.0.2.1 is split into Network plus Node. So is the network number 10, or 10.2 or 10.0.2 ? In early IPv4 networks address classes were used to identify the number of bytes allocated to the network component. To determine the class you needed to examine the most significant byte (far left). All modern networks use the Ethernet data link protocol. Ethernet uses a shared media and is negatively effected when a large number of nodes are connected to the same media. This is just the same as having too many kids in the same classroom. What would happen if you had a classroom with 100’s of desks i.e. hundreds of pupils? So even though a Class A address can accommodate thousands of nodes it it totally impractical to put this many nodes on a single network. The solution to the problem was to split the network into small networks called sub networks or subnets. It is important to understand that the network part of the address is only used for routing IP packets on the public internet. Once the packet enters the private network then the Node address is used and the public Network address is not used. 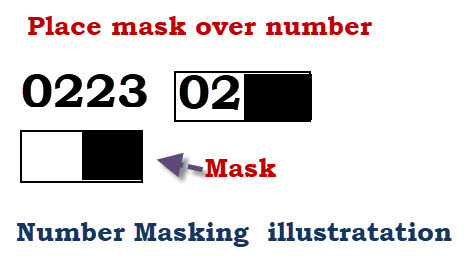 The technique used to create subnets is to use a Mask. The mask effectively hides the Node component and leaves the network and sub network components. If the IP address was printed on paper we could hide the last byte by placing a paper mask over the number with three holes. To do this on a computer we use a number which we then logically AND with with IP address. 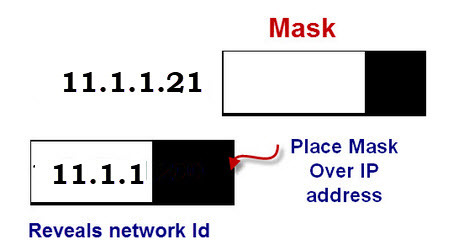 The Subnet mask determines how the IPv4 address is split. Th example above used a class A IP address we can do the same with a class B address. Subnetting on a byte boundary is the easiest to do and understand but we can also subnet on non byte boundaries. Have possible 28 -2 hosts =254 which is enough. We need 4 subnets which requires 4 bits and we have 8 bits. So we have more than enough. Classless Inter-Domain Routing was introduced in 1993 to replace the classful network design. The best way to learn to do subnetting is to try some examples. We will look a some common subnetting problems that arise when creating networks. 1 – You have been allocated a class C network address of 201.1.1.0 how may hosts can you have? 2- You have been allocated a class A network address of 21.0.0.0. You need create at least 10 networks and each network will support a maximum of 100 hosts. Would the following two subnet masks Work. 3 – You have been allocated a Class B network address of 129.1.0.0. You have subnetted it using the subnet mask 255.255.255.0 How many networks can you Have and how many hosts can you place on each network? A1– 255-2= 254 – Why? host addresses of all 0’s and all 1’s are not allowed. A2- Yes you only need 8 bits for 100 hosts and both subnet masks would give you that. A subnet mask of 255.255.255.0 would give you lots of networks (2 16) and 254 hosts. A subnet of 255.255.0.0 would give you lots of hosts (approx 216) and 256 networks. So far we have been subnetting on a byte boundary using class A and B addresses. Now we are going to look at how we subnet on a non-byte boundary using a Class C Address. Exercise- You have been allocated a class C network address of 195.1.1.0. You need to create 5 sub networks each network has a maximum of 10 hosts. 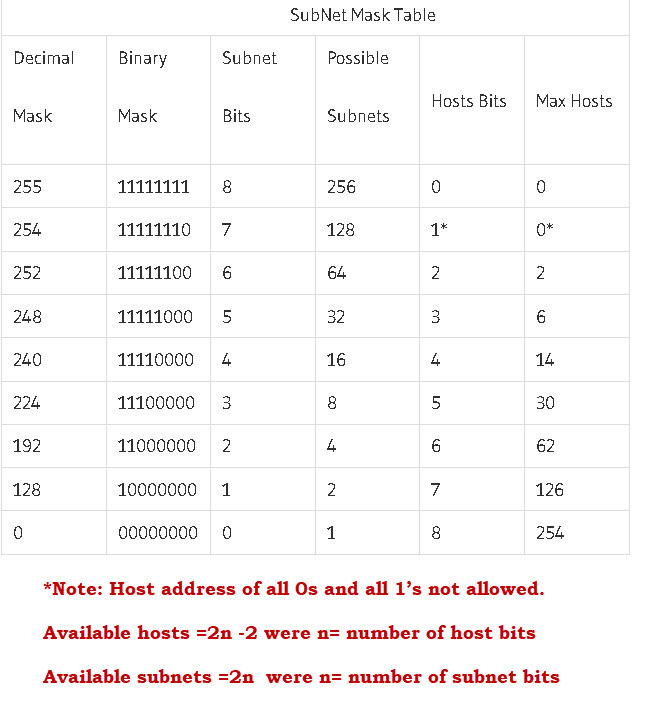 We can only use the first 8 bits for out subnets as these 8 bits have been allocated as host addresses. So Subnet masks of 255.255.255.224 and 255.255.255.240 would both work. Below is a simple subnet table that makes it easier for calculating subnets. “Well in early IPv4 networks address classes were used to identify the number of bytes allocated to the network component.” Please note that a comma is needed here and depending on where you will place it the provided information will be entirely different. In the process of simplifying, you over complicated the whole process. For decades I roamed the earth with the horrible awareness that I don’t grasp subnet masks and CIDR notations … 20 mins on this page and now it all seems so clear. Thanks! Thank you for this explanation, it is good as always. It was one part that I didn’t quite understand though. How do i know how many networks and hosts I can place on each network? The lower 8 bits you can use for subnetting. now 0000 and 1111 are normally not allowed for network or host addresses therefore you can have 14 subnets and 14 hosts. I thought I could never understand networking concepts. Your article is making me think, if things are explained in a way as you have done, I can and everyone can understand anything. Thanks Steve!! Thank you, the clearest explanation of masks and sub-netting I’ve found.